“I really thought of what I want people to know in Pakistan as I have garnered some attention there. Anybody should be able to succeed — whether you’re a woman, a religious minority or whether you’re gay. It just doesn’t matter,” she says. It seems that there is no way to win. People expected controversy to erupt. When that didn't happen, that in itself is now being touted as controversy. And yet - rarely did people focus on the amazing science behind the discovery or the curiosity and wonder that drives people like Nergis to do what they do. (you can also find cynical with a holier-than-thou attitude articles here and here). Hamari Kainaat (Urdu) - Episode 12 from Umair Asim on Vimeo. And then here is a 10 minute segment for our really cool local radio station, The River. And if you like a more detailed discussion, then you can listen to our conversation on the Bill Newman Show. 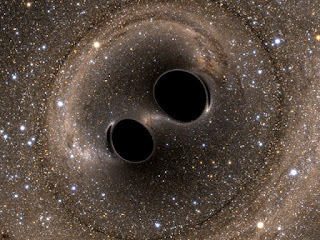 A little over a billion years ago, two black holes were orbiting each other somewhere in a galaxy far, far away. At this time, life on Earth had just found a successful way to include more than one cell in a body. Indifferent to the happenings on the Earth, these black holes were locked in a spiral of death. One black hole had mass equivalent to 36 Suns. The other was 29 times as massive as our Sun. Nature had already sealed their fates. 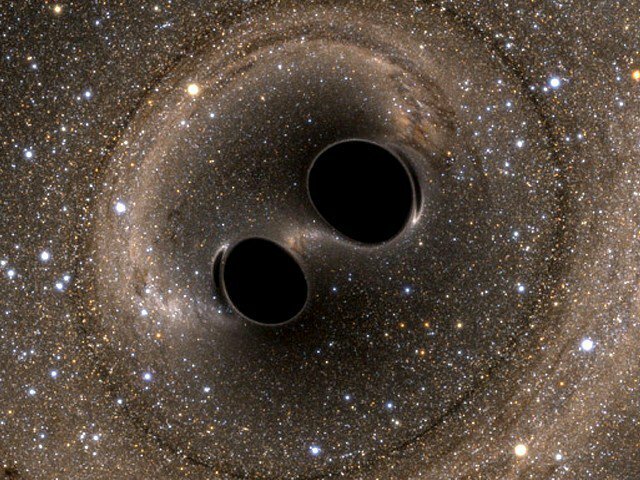 With a sudden gasp, the two black holes merged into one. This larger black hole had a mass of 62 Suns. The missing mass – about three times the mass of our Sun – had all turned into enormous energy, briefly equaling the energy output of all the stars in the observable universe. This energy emanated out in the form of gravitational waves – ripples in the fabric of our universe. Such events have been happening for billions of years. Many such ripples have passed the Earth in its 4.5 billion year history, but none, as far as we know, were ever detected. The multicellular life on Earth evolved into a spectacular array of complex life forms. One of the descendants, hundred of millions of years later, started pondering about the nature of the universe. One member of this species postulated that the universe we inhabit might best be described as four-dimensional: Three dimensions of space (length, breadth, and height) and one of time. This person, in his General Theory of Relativity, went on to argue that any object with mass would bend the space-time fabric in a proportional way: the bigger the mass, the bigger the space-time bending. We can think of a bed sheet as an analogy. A tennis ball placed on the sheet will create a smaller bending in the sheet than a cricket ball. The ball used in shot-put would create a larger bending than the cricket ball. In the universe, the Sun and the Earth both bend space-time, but the Sun’s impact is much larger than the Earth. The Earth’s motion around the Sun, in this view, can be seen as the motion of motorcycles in the ‘wall of death’ (maut ka kuuan). This is a radical way of thinking about the universe. The mathematics behind this thinking is complex and beautiful. But does it describe the universe we inhabit? Some other members of this particular multi-cellular life-form came up with ways to build tools and test this theory. Time and time again, the tests came up positive: the predicted shift of stars a solar eclipse; the precise prediction in the precession of the orbit of Mercury; the bending of light from distant galaxies in the form of gravitational lenses; and the precise decay in the orbit of binary neutron stars (the last one resulted in the 1993 Nobel Prize in physics). The mathematics of the theory also predicted the creation of gravitation waves. These are not waves of light, but rather a disturbance in the space-time itself. The past success of indirect tests of the theory suggested that these waves must exist as well. Some of the smartest minds on the planet wondered about ways to detect these waves. One such mind grew up on the part of the Earth’s continental plate that is responsible for the creation of the Himalayan mountain range. She became part of the team that eventually detected the gravitational whisper of those two merging black holes – from a billion or so years ago. For the first time in the 4.5 billion year history of the planet Earth, a species has found a way to ‘see’ the universe in gravitational waves. What is truly astonishing is the fact that these bipedal beings, residing on a small planet in a remote corner of an average galaxy, would use the language of mathematics to decipher the universe itself. We are just beginning, and have much to learn. But today we can take a break to celebrate this incredible success! More myths about "science and religion"